Endless Referrals by Bob Burg is an amazing book. Every business will benefit from referrals. Every entrepreneur needs a solid plan to get more referrals. 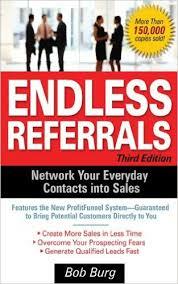 When it comes to getting more referrals for your business, I would HIGHLY suggest you read Bob Burg’s book “Endless Referrals.” I absolutely love this book and consider it a must read for any sales professional, network marketer or entrepreneur. Bob Burg provides some simple, practical step-by-step instructions that anyone can follow to systematically get more referrals. I have read this book more than five times now and enjoy it more and more each time I read it. What I want to do in the rest of this post is share some of my favorite Bob Burg quotes from the book. Each quote is in bold and italics. After each quote I will also share my own two cents on the topic. Enjoy! # 1 Without a list of names of people to contact and offer your products and services, you have no business. The money is in the list. All businesses need fresh leads and good prospects. Smart entreprneurs focus their time and money generating leads, meeting new people and building their list. # 2 Prospects respond positively when a salesperson has posture. People want to do business with people who are professionals, who exude confidence, and believe in what they are selling. Show me someone who is meak and I will show you someone who struggles in sales. If you don’t believe in yourself others won’t believe in you either. # 3 What is the best way to develop true posture? Simply by having such a large list of quality names that you never, ever have to be concerned by someone not being interested in doing business with you. You’ll always remain polite, but again, you won’t be emotionally attached to the results. When you have tons of prospects you won’t care who buys and who doesn’t. This is one of the key secrets to success. When you have more leads than you know what to do with, you don’t care who buys and who doesn’t. # 4 The average consumer today is more knowledgeable, is less trusting, and wants to have a know you, like you, trust you relationship with her salesperson. People don’t want to feel like a number. They want you to make them feel important. # 5 Networking is the mutual give and take that results in a winning situation for everyone involved. Every transaction should be a win-win for everyone involved. If it’s all about you, you won’t be in business very long. # 6 All things being equal, people will do business with, and refer business to, those people they know, like, and trust. If people don’t like you or trust you they won’t buy from you, regardless of how good of a deal you have to offer them. # 7 Nobody who is truly successful ever does it alone. Success is a team sport. The more fans and supporters you have, the easier it is to be successful in business and in life. # 8 Girard’s Law of 250 states that each of us has a personal sphere of influence of about 250 people. Everyone has at least 250 people who like them, know them and trust them. If you tap into these people, treat them well, and stay in touch with them frequently, you will have an endless source of referrals. # 9 Nothing gets around faster than negative comments. Good news travels fast but bad news travels faster. When issues arise, deal with them immediatly and try to correct the situation. # 10 You can use your business card to get the other person’s business card. The ONLY purpose of your business card is to get your prospect to give you theirs. Handing out business cards is of little value. The real value is getting other people’s business cards, so you can follow up with them. # 11 Business cards by themselves are not about to make you, me, or anyone else successful. It’s caring about the other person and his wants, needs, and desires. Take your eyes off yourself and focus on your prospect. Use your business card to meet new people, but make sure you focus on helping them and serving them. # 12 In sales, the person who asks the questions controls the conversation. You have two ears and one mouth for a reason. Use them in that proportion. The best way to be a good conversationalist is to ask questions. Get the other person talking about themselves and they will want to spend time with you. # 13 Great salespeople never push. They lead! Be a leader. Never use pressure or hype. Lead people to the decision you want them to make. # 14 If you are networking correctly, the other person will never notice you are networking. Simply have conversations with people. Get them talking about themselves. Be nice and kind. Show a genuine interest in others. # 15 After the introduction invest 99.9 percent of the conversation asking the other person questions about himself and his business. Do not talk about yourself and your business. Listen, listen, listen! # 16 People we find most interesting are the people who seem most interested in us. When people like us we naturally like them. # 17 In a free-enterprise based economy; the amount of money you make is directly proportional to the number of people you serve. If you want to make more money, serve more people. It really is that simple. # 18 You’re not just after these people’s business; you’re also after the business of their 250-person spheres of influence. The real purpose of meeting someone is to tap into their sphere of influence. # 19 Once you’ve met your new contacts send each one a personalized thank you note. Use the personal touch whenever possible. A short, handwritten note is the best way to do that. # 20 Little differences make the big differences! Do the little things. Very few people do them anymore. Trust me, when you do the little things you will get noticed. # 21 What you really want is for your networking prospects to think of you and only you whenever anything comes up concerning your business. When you treat people well and build a good relationship with them, you won’t have any competition. # 22 People generally don’t care about our success as much as we do. Most people only care about themselves. That’s not a bad thing. We all have self-interests. # 23 Always give more in use value than what you take in cash value. Under-promise and over-deliver. Give the people more than they paid for and they will refer people and do repeat business with you. # 24 When people sense that just being associated with you, their lives will experience significant increase, they will naturally want to advance the relationship. If you provide value to others, they will want to associate with you and do business with you. # 26 It’s so important for sales professionals to realize that people buy a product or service not for its features but for the benefits they realize by taking ownership. Features tell, but benefits sell. Whenever you talk to people about your products or services, show them what’s in it for them. # 27 You can raise your salary one of two ways: by making more calls or by turning a higher percentage of initial calls into contacts. You can focus on working the numbers or having better conversions. I suggest you do both. # 28 Never try to sell your product over the telephone. The only thing we would ever try to close on the telephone was the in-person appointment. The purpose of a call is to set the appointment. The purpose of the appointment is to make the presentation and get the sale. Never forget that. # 29 Ask yourself where your prospects hang out. Spend time in places where your best prospects are most likely to be. Figure out what associations and groups they are members in, and join those groups. # 30 Prospecting is a numbers game. The more things we do right, however, the more sales we will get in less time and after calling on fewer people. Initially, it’s a game of numbers. But, it’s also a game of skill and strategy and relationships. # 31 Form a community web-ring. Form strategic alliances with other entrepreneurs in your local area. Serve others. Help others. What goes around comes around. You are a direct reflection of your ten closest contacts. Choose wisely. # 32 Choose to Build Your Business from the Top: Select your top twenty clients and determine which organizations they belong to. Then target these groups and ask your best clients to assist you in understanding and working in their market. This is simple, but great advice. I think it’s much smarter to focus on five or ten quality prospects than hundreds of low quality products. # 33 The key is to find a cross-promotion partner that targets the type of people you want. Find someone in a non-competing business who has a similar customer base and share leads with each other. Refer people to them and have them refer people to you. This creates a win-win for both parties. # 34 Research indicates that prospects who are approached through a referral close twice as easily, buy more in the first two years, and stay with a salesperson or company longer than other forms of leads. Your referrals are your best prospects. PERIOD. # 35 You’ve probably learned before that people buy emotionally and back up that emotional decision with logic. Appeal to people’s emotions whenever possible. Figure out what their hot button is and focus on that. # 36 Don’t expect anyone to believe in something you don’t believe in yourself. If you don’t believe in your products or services, no one else will either. # 37 What someone else says about you is infinitely more believable than what you say about you. So let them say it. Use testimonials whenever possible. They are your most powerful selling tool. # 38 Small businesses and independent professionals need their marketing to pay off quickly by returning sales, so that they can start the cycle again. Small businesses need a positive ROI on all of their advertising and marketing. This keeps the leads and sales coming in so they can reinvest back in their business. # 39 Advertise where your prospects will already be. Focus on your niche and avoid mass marketing. Always focus on a tight, focused target market. # 40 The only purpose of my advertising is to get the prospect to call a toll-free number or to visit a website for an offer of free information. Always use the two-step selling process. Collect a lead, give away something for free, and let your information promote whatever it is that you sell. # 41 If you want to get, give first. This is great advice. The more people you serve the more money you make. # 42 A lead-generation magnet is a purely educational piece of information that you offer to prospects in exchange for their contact information. Your # 1 goal is to get more leads. Once you get leads, you can follow up with them frequently and cultivate a relationship with them until they are ready to buy. Bob Burg is a well respected author, speaker and consultant. He is the author of several popular books to include The Go Giver, Adversaries Into Allies, and Endless Referrals. Endless Referrals, now in its third edition, was published in November 2005. It has 304-pages and comes in soft-cover and Kindle format. It is published by McGraw-Hill. As of January 2016 it has 130 customer reviews on Amazon with an average 4.7 rating. It is available anywhere books are sold. In review, Endless Referrals by Bob Burg is a must read book for any salesperson or entrepreneur. Overall, I give the book a 9 of 10 stars. I’ve read it several times now and each time I re-read it I pick up something new. If you haven’t checked it out yet you should. What are your thoughts? Have you read “Endless Referrals” before? If so, did you like it? Why or why not? Leave a comment below to share your thoughts. Great Blog post I just went on amazon and bought this book it will help to build my team in the future! Yep, I love this book. This does sound like a very good book, not only about getting referrals, but on many other aspects of network marketing and sales. Some of these quotes were very interesting. #12: The one who asks questions controls the conversation. This is so true. When we ask questions, we gain insights on the person. #13: Great salespeople never push: they lead. It is all about educating and holding the person’s hand to get them to do what you want them to do. Hold their hand, don’t push them from their back. I have discovered that if people like you, even if they don’t accept your offer, they will provide a referral if you just ask. This is a great book for any entrepreneur. I also heard Bob speak a few months back and he was great.